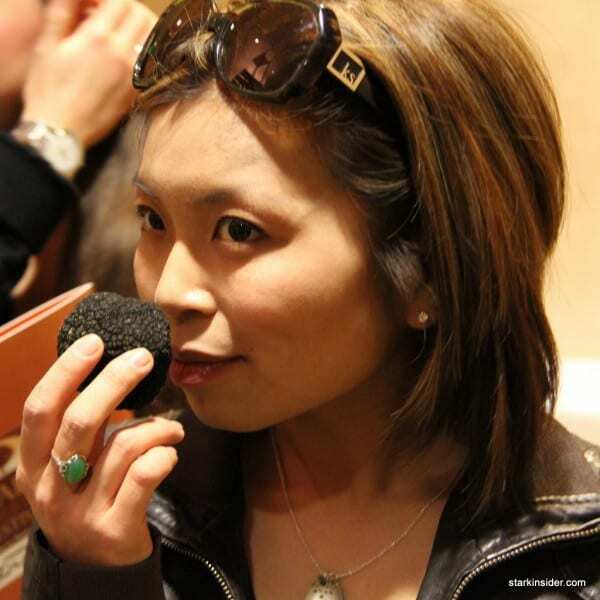 It was with much relief and heady excitement when I was able to finally inhale the aromas of a truffle. Thankfully I didn't start squealing. Truffles on display after the keynote at the inaugural Napa Truffle Festival. 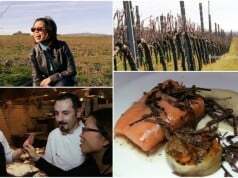 When in Napa, I am usually visiting proprietors and winemakers at their wineries and tasting the fruits of their labor, which is an intertwining of nature, art and science. Today though, I find myself standing in a conference room sniffing what resembles a lump of coal. Behind me a few others wait for the coveted opportunity to follow suit. I am at the inaugural Napa Truffle Festival at the Westin Verasa. No, not the chocolate type as I first had to explain to Clint when we received our invitation; the underground fungus type which is far more rare and revered in the foodie world. 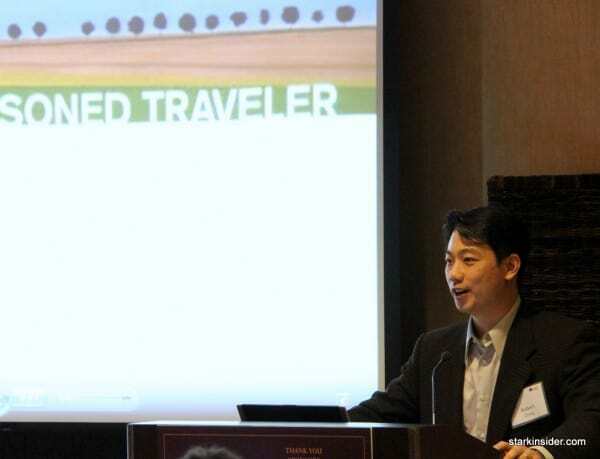 We just wrapped up the keynote, presented by Robert Chang, Managing Director of the American Truffle Company and Doug Duda, Chef Educator and host of the show, “The Well-Seasoned Traveler” on A&E. Robert kicked off the event noting that this inaugural festival, which took one year to pull together, will celebrate and promote awareness of truffles in our culinary repertoire. Robert heads up a company whose mission is to help people establish truffle orchards from site selection to orchard management. Cultivating truffles is a burgeoning industry here in North America and has been growing in interest as the world supply of wild truffles shrinks and as one presenter put it, “it’s the most expensive crop you can grow, legally”. Europe, Australia and New Zealand had started pursuing this endeavor a while back already. 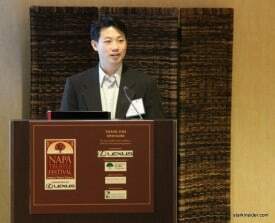 Robert noted that Napa, with its rich culture of culinary excellence, population well-versed in agriculture from the wine industry and ample supply of fertile land, makes it a perfect place to host a world-class truffle festival. North Carolina and Oregon both have annual truffle festivals as well. Like those who come to Napa to grow grapes and olive trees, he also noted that the Napa region was along the same latitudinal stretch as the Mediterranean region in Europe where truffles grow in the wild. Robert introduces Doug to the podium. Doug Duda, creator and host of A&E’s The Well-Seasoned Traveler, which explores the world of food and drink, took the podium and invited us on a truffle hunting excursion in France. His first encounter with truffles was when his wife was teaching a course for American Express in France and he decided to tag along and take a cooking course. At the time, having “not grown up with a silver spoon” in his mouth, he knew very little about truffles. However, when it was announced at the start of the course that they would go to the famous open air markets and truffle hunting, everyone around him started squealing. Doug, at the time, didn’t know what the excitement was all about. He was on his way to discovering truffles. 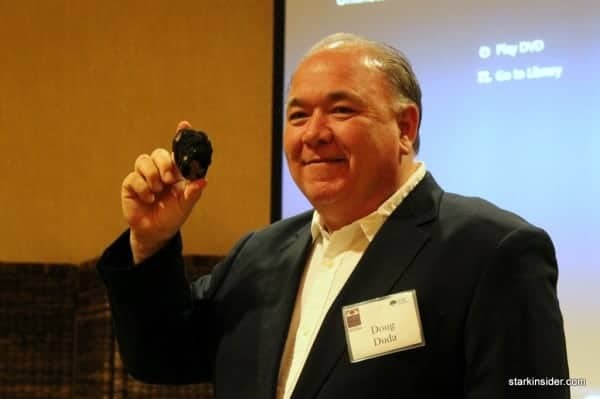 Doug Duda, host of "The Well-Seasoned Traveler" on A&E holds up a truffle. Before he knows it, he is standing at the front of a farm. In front, a flinty-eyed french farmer who brings out his little dog. The dog shoots out into into different directions, starts digging, and each time brings back a truffle. The people around him started squealing again. By now, the thought of a pile of truffle was getting me excited as well. Doug recalls the farmer flattening a piece of well-worn foil to wrap up the truffles in and bring them back to the farm kitchen where the farmer’s wife started to slice them. The truffles were used to make truffle omelets. This was the start of Doug’s love affair with truffles. In the dead of winter, after all the tourists have left for the season from Provence, Doug was able to explore how the locals enjoyed their truffles. In the end, it is the simple truffle omelet which is almost the perfect way to enjoy truffles. It is just eggs, french butter (which is important) and truffle shaves. If you really want to get fancy, the locals add a little water just so the truffle slices steam and heats up. The second time Doug went to France, he was there purposely to seek out truffles. He went to visit a guy who owned a truffle farm. Doug envisioned the farm would be full of lush trees and grass. Instead, the area between the trees was filled with gravel. The more he got to know the truffle hunter, who was a research chemist, Doug started to truly appreciate the secretive heritage of the truffle business in France. If you were out looking for wild truffles, it would be the discolored grass around a tree that would signal the possibility of truffles underground. In order to keep people from having any idea how things were going on the farm, gravel was put everywhere on the farm so people can’t see where and if there were truffles growing on the truffle farm. Doug also learned of other secrets…he leans a little closer over the podium before he starts sharing. I sit up a little straighter –everyone likes to hear a secret. It turns out it is common practice of the thrifty French farmer to take all the truffles he has acquired and put them in jars with eggs so that the eggs become infused with the scent of truffles. Then the farmer would take the truffles out to market. He would keep the eggs, now with a hint of the truffle flavor. In this way, the farmer was skimming a little from the top. Doug also asked about the dogs. Why were there all these dogs in the truffle hunting business and no pigs? At first, Doug didn’t get much of an answer. Doug noted that this is also what happens when you ask a chef for a recipe. At first, they don’t reveal much, but if you keep asking, you start to get it out of them. The real story why dogs are now used instead of pigs? Who knows? But there is the tale Doug was told. The tradition of using pigs disappeared with the invention of the automobile. In the old days when you went truffle hunting and brought out your pig people would be suspicious you were out to find truffles but it would be hard to follow you without being too obvious. However, when cars became common, if people saw you had a pig next to you in the car, they would think, “Follow that car!” A dog, who knows, you may be going to the ATM or anywhere else. Doug loves culinary travel and besides visiting a farm, he also went to one of the truffle markets which are still operated during truffle season every Saturday morning. It is a very quiet market where you see people with bags behind vans and others sniffing inside the bags. It is hard to tell who is selling and who is buying. There is also long-standing relationships where many buy from the same person for decades. 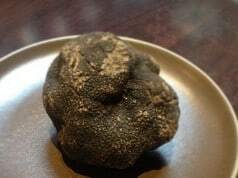 Some buyers represent restaurants buying 10 kilos of truffles. It is not uncommon to test a few truffles to make sure they are not old or previously frozen, especially if the buyer and seller have never worked together. Most of the payment is still in cash and people are very secretive about how much truffles they bring to the market and how much money they leave with. 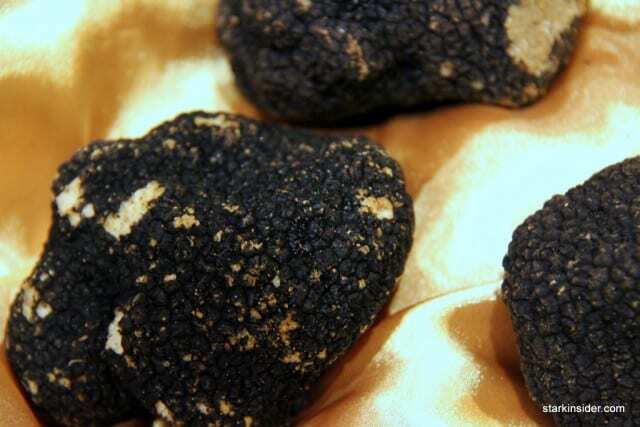 Truffles that would sell for $30 at the market would retail in France for $55. Export them to the US and the price jumps to $100. In January, there is a festival in Richerenches, Provence, a small town renowned for having the largest truffle market in the country. The festival pays homage to St. Anthony who is the patron saint of the pig so naturally he has become the patron saint of the truffle. The whole church service is given over to the truffle; it’s a 50 year-old tradition. Everyone brings truffles which are donated during collection. Doug notes it is perfectly ok to pick up a truffle and smell it as the collection passes by. At the end the basket of truffle is auctioned and the proceeds are donated. By the end of this journey, while an excerpt from Doug’s show, “The Well-Seasoned Traveler” was still playing on the screen, all I could think about was sticking my nose into a truffle. And so it was with much relief and heady excitement when I was able to finally inhale the aromas of a truffle. Thankfully I didn’t start squealing. Ah, the scent of a truffle.